The new and completely redesigned soliant.com offers ease of navigation, bright imagery and mobile-friendly features. 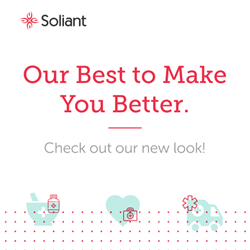 Soliant Health, a leading specialty healthcare staffing provider and part of The Adecco Group, is pleased to announce the launch of its newly redesigned website – soliant.com. The website is positioned to be a leading resource for job seekers and employers in the healthcare community. Created with the user in mind, the new soliant.com strives to deliver improved navigation for both job seekers and employers. An improved “Quick Apply” feature allows job seekers to easily and efficiently upload resumes via web-based platforms such as Dropbox and Google Drive. A one-click talent request form allows employers to quickly submit their hiring needs to a specialized personal consultant who is cross-trained by specialty in the placement process. To learn more about Soliant, please visit soliant.com. Soliant Health, an Adecco Group company, is a leading provider of specialized healthcare staffing services to hospitals and healthcare providers. By supplying traveling healthcare professionals on both temporary and direct hire assignments, Soliant Health delivers comprehensive healthcare staffing services to leading facilities across the United States. Soliant's teams of professionals are qualified to fill physician, nursing, therapy, pharmacy and other healthcare positions.